This is a fun and quick knit. I have actually been learning to read and knit using this project. Also, I am a big fan of the color. 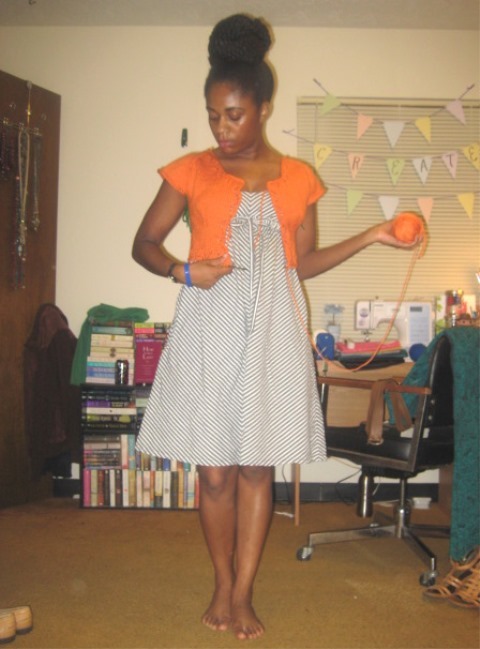 This is my first time making something orange and I am excited about pairing it with so many of my dresses once it is complete. The bust darts were a very fun feature and super-simple to make. It just involved decreases. So far, I have a few more rows remaining on the body. I am doing the bottom band. Then, I will be moving on to the sleeves. This is the first time that I have made an Andi Satterlund design that does not involve set-in sleeves made with short rows. I do believe that this is her first cardigan design and that may be the reason for it. 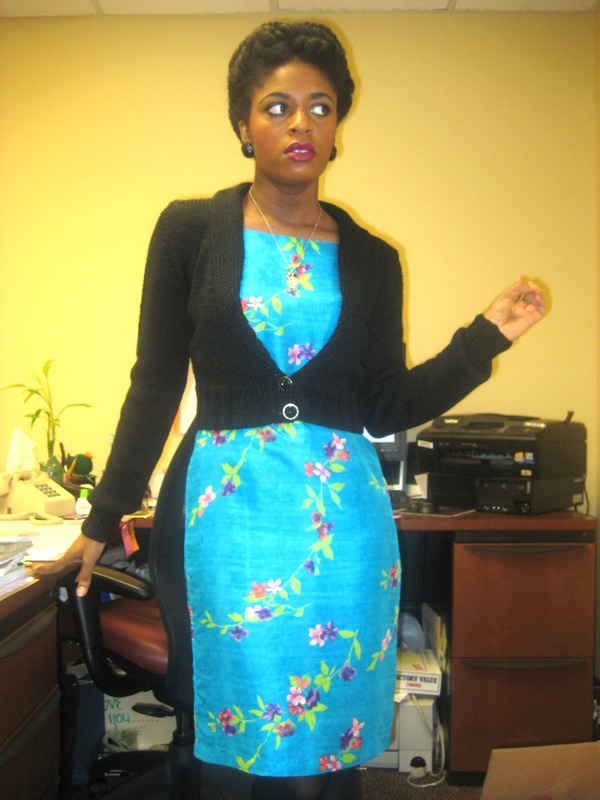 However, I still like the fit of the cardigan and I can’t wait to wear it with my Spring dresses. 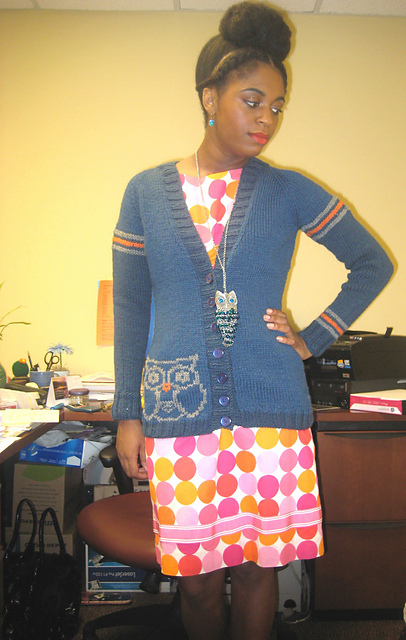 It is also the perfect little cardigan to carry along for my cold office and to take to those air-conditioned movies. So, it is busy around these parts but, I am trying to get this post up because it has been awhile. 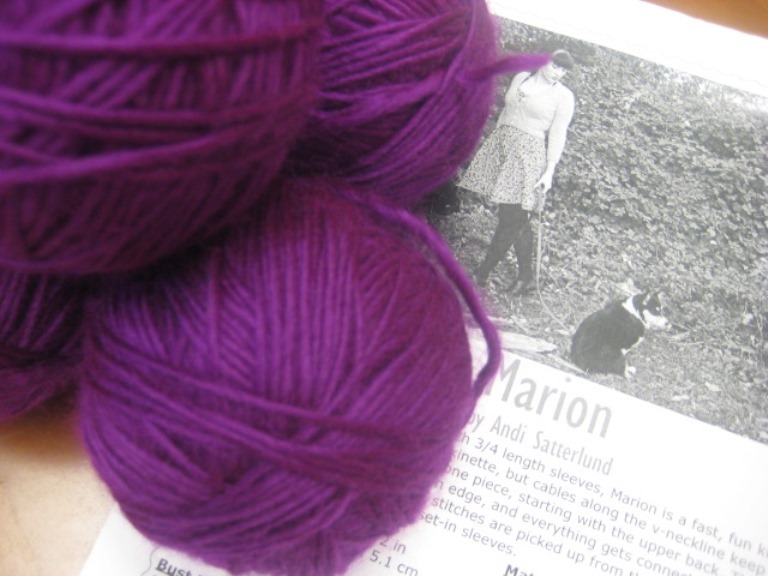 I am finishing up my Marion cardigan so, of course I am thinking about my next project. 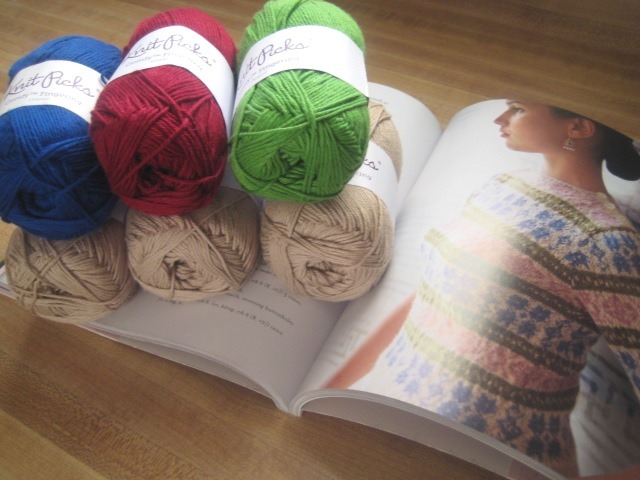 I will be joining Andi’s Christmas sweater project and the pattern I will be doing is Vivien. I will mainly work on this project at home because of the colorwork. I don’t think this is a good on-the- go project. 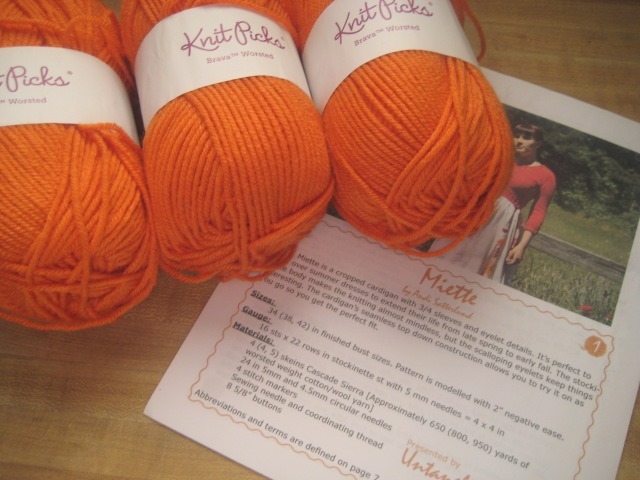 My project for my knitting bag (on-the-go) will be Miette. I put off knitting this for far too long so, I look forward to starting it soon. I’ve been making some headway with my Marion cardigan. I finished the back, right front, and left front. I am currently working on body shaping. I will probably work some more on this cardigan over the weekend. But, it is definitely one of those projects that needs my concentration. So, I won’t be watching a movie or television with it. I’ll probably just listen to some music. Well, that’s it for now. Have a great weekend!! My Geraldine and Ethel are currently waiting to dry. I steam blocked them last night. (Post coming soon on those finished objects.) 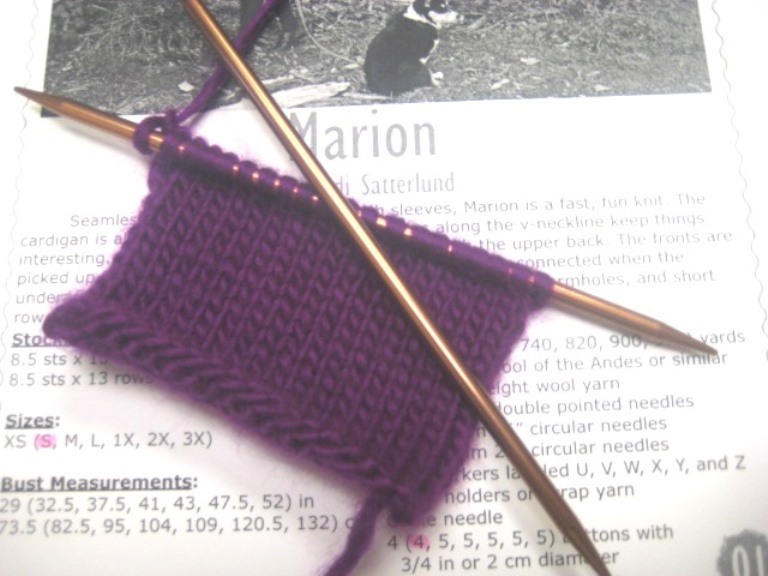 I am now anxious to start Marion another pattern by Andi Satterlund. Marion has been in my queue since April of 2013 and it is now past time to start it. First off, I am in dire need of a purple cardigan. Purple is one of those colors that I hardly ever wear but, I do want to implement it a bit more in my wardrobe. 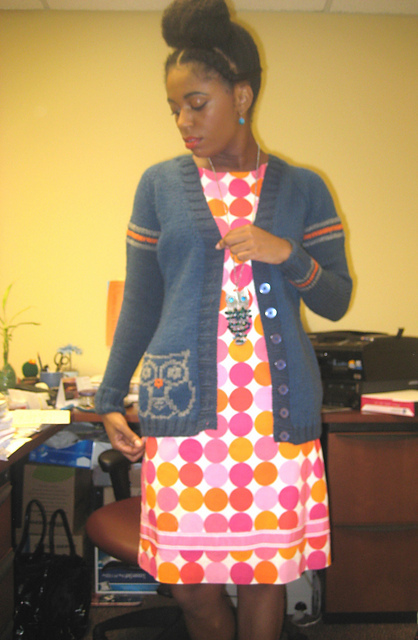 I actually purchased the yarn and buttons for this cardigan during my vacation last summer from Joann’s Fabric store. I am excited about revisiting cables. It has been awhile since I’ve made anything with cables, which is crazy considering how much I love them. I think my last cabled project was Chuck (my favorite pullover). The cabled neckline is very nice and I like the added bonus of the cables on the wrists. I plan on making the Small size. Hopefully, all will go well with this cardigan (as they usually do with Andi’s patterns) and I will have a wardrobe staple with this purple cardigan. I finished the cardigan that I was pattern testing for Andi and I am very pleased with the results. Simple yet stunning. Indulge me as I break down my favorite aspects of this cardigan. 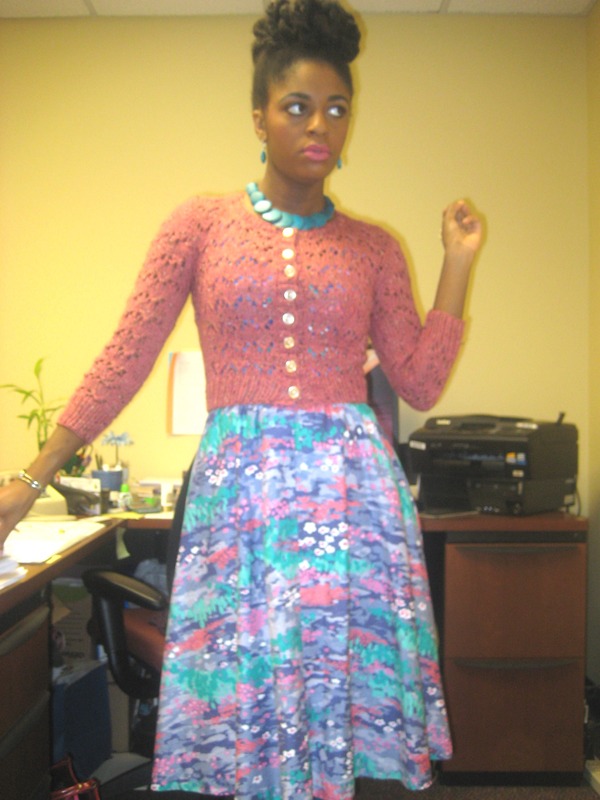 I was immediately captured by the vintage vogue feel of this cardigan. 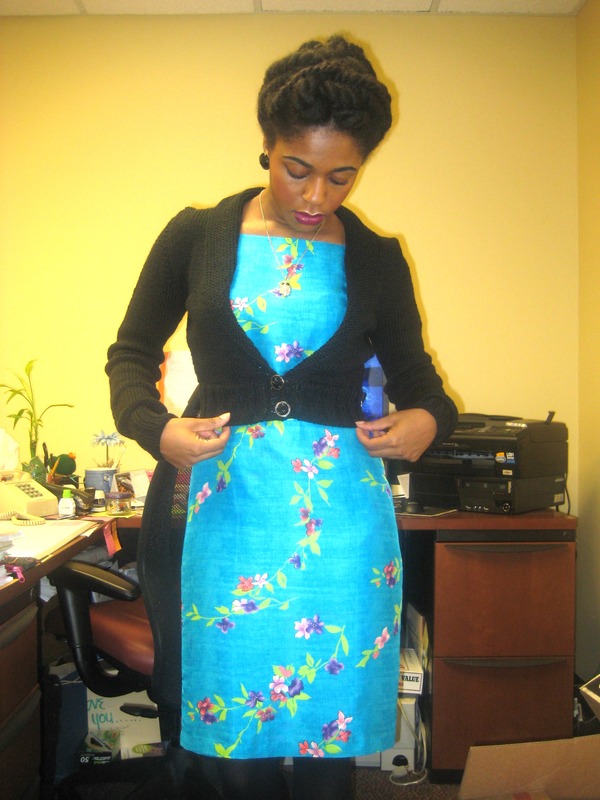 The deep neckline, the nipped in waist, and the full sleeves all worked so well together. It really shows off the feminine figure. While the cardigan is mainly in stockinette stitch, the neckline is in garter stitch. This really makes it stand out. In addition to the garter stitch neckline the folded back collar is just so gorgeous to me. 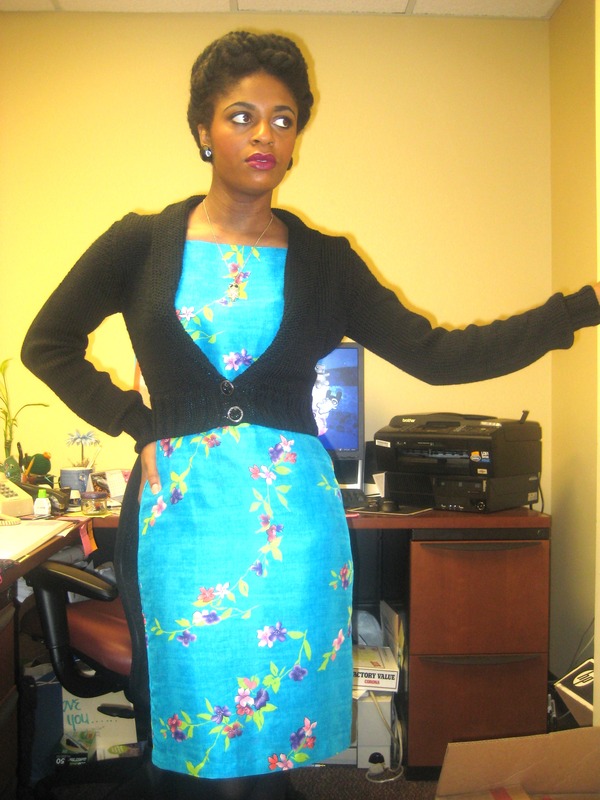 I am also really attached to the deepness of the neckline because it shows of my dresses beautifully. I was very happy that this cardigan only featured 2 buttons. For this reason, I thought long and hard about the buttons that I would choose for this cardigan because I knew they would stand out. I didn’t know they would turn out this gorgeous against the cardigan and I am happy, happy, happy with my choice. I have already gotten a compliment on the buttons alone. This was my first time making a black wearable. I usually flock to the more vivid and bright colors (you’ll see in my next project). But, I wanted to choose a color that was sultry. I had been serious debating with a wine red, eggplant, or black. Black won. I am so happy with this choice because it goes wonderfully with most of my dresses (I actually plan on wearing this on Sunday to the Christmas Concert with my pine green dress). It was kinda hard to capture the details on my camera with this dark color but, it worked out. 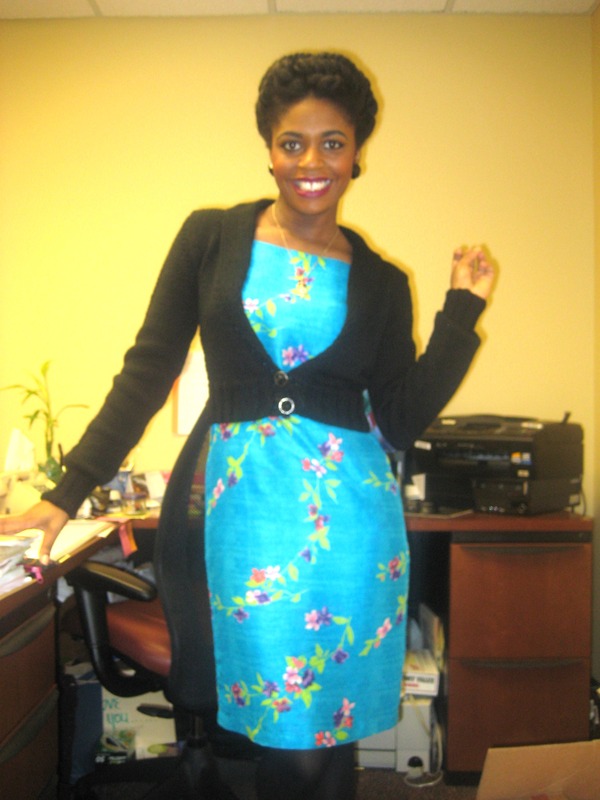 I wore it with one of my brightest dresses and it winterizes my bolder colored dresses. Andi is really great at breaking down patterns and making them simple as pie. It was very easy to follow along with this pattern and I didn’t have any major problems. 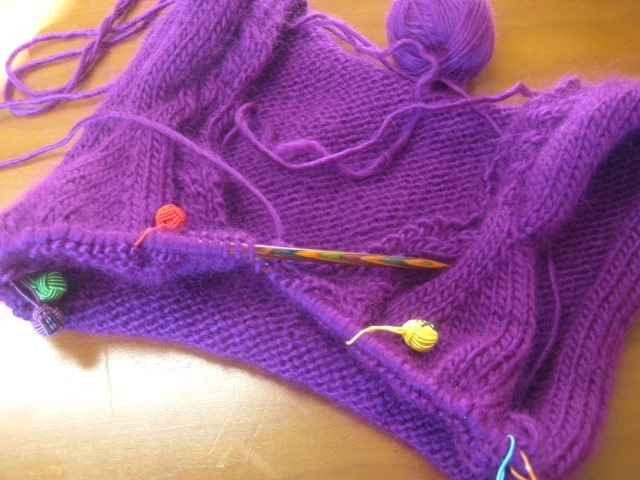 First off, the body works up very quickly because this is a deep neckline so, there is not much to knit. Also, the body is in the simple stockinette. Then, the sleeves flew by too! I thought that it would take awhile for the sleeves since they are full but, it was no biggy. The sleeves are a simple stockinette and ribbing. 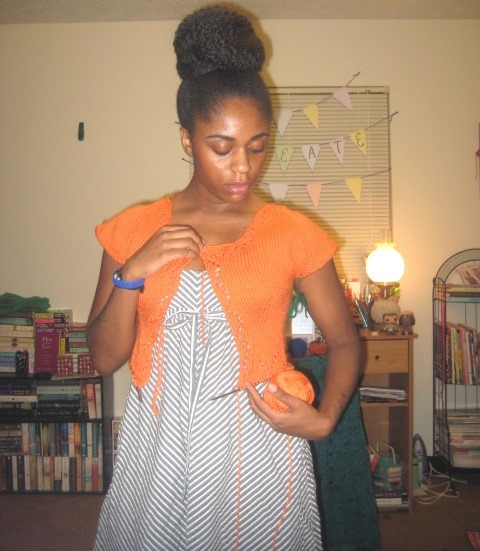 Andi used her signature set in sleeves using short rows so, no seaming required. Oh yeah, the entire cardigan in seamless! The neckline does take a bit longer than the typical ribbing neckline used in cardigans. But, this is because of the shawl-like neckline. It was easy to follow along with this part also. I was bit nervous about tackling it but, it was so simple! I finished the neckline very quickly too. This cardigan took me about 3 weeks to knit. How brilliant is that. 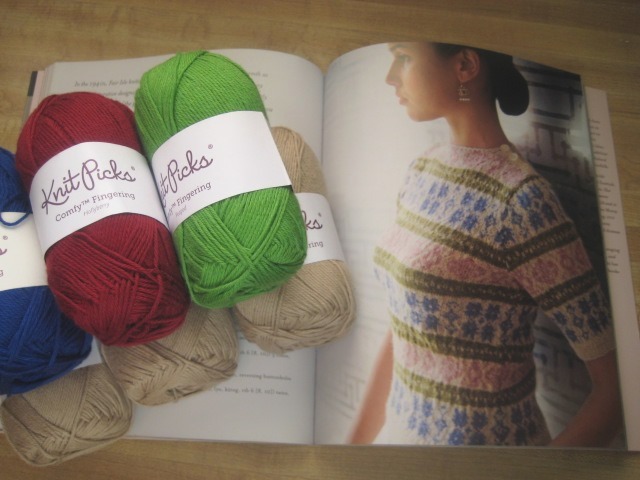 Next Up: My yarn arrived for my Aiken and Geraldine pullover. YAY!! I really want to cast on tonight but, I am trying to make some headway with the crochet bunnies. I really look forward to finishing this because I have this perfect holiday dress that I think would look perfect with it. I would like to wear it to my college’s Annual Christmas Concert, which is on December 8. So, even though I have until December 15 to complete the pattern I am aiming for December 8. 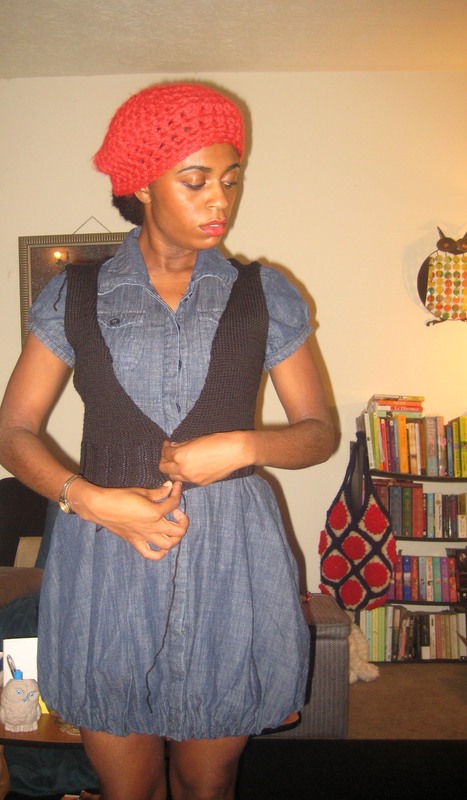 OAN: The hat I am wearing was made by sister April from the book, The Crochet Boutique. I made the pattern also in green and turquoise but, I find myself wearing the red hat the most. It’s called the Bonnie Beret and with the new Bonnie & Clyde movie coming out soon I really enjoy wearing it. This pattern is also available for FREE. Well I am making another shell net cowl. Remember I previously blogged about my finished lace cowl. Well, when I was working on that cowl in the knitting group another knitter asked me to create one for a friend of hers. She purchased the yarn, which is Malabrigo Lace in Cactus Flower. I am enjoying using this yarn and I have to purchase some for myself. When creating this cowl again I noticed that it is supposed to be a moebius cowl, which I did not do for my first one. Because I really loathe mistakes I gave that cowl to my mother instead of just tossing it. (I knew I wasn’t going to rip it back and start over because that yarn is so delicate that it breaks when being ripped back.) She loves it. I have been anxious to create something from my book Geek Chic Crochet (review coming soon) but, I knew I couldn’t obligate myself to a cardigan at this moment because of my current craft workload. So, I started this turban headband on Tuesday and it is still a work in progress. This is a great indication of how busy I have been lately because this is definitely a project that can be created in one night but, I just have been fitting it in when I can. I am using Red Hear Super Saver in Shocking Pink. This shade of pink is my favorite and I have yet to find another yarn retailer to create one so perfect. I decided to make this headband to avoid having cold ears this winter. I usually wear my hair up in the colder months but, since it is so thick then a hat can’t go over it. So, this should alleviate that problem and I look forward to warm ears. I want more turban headbands in gray and tan. This is a very simple pattern that honestly you can just look at to create. It is great for beginners and for the experienced that wish for a relaxing mindless project. So, this is the project that I am most excited about!!! 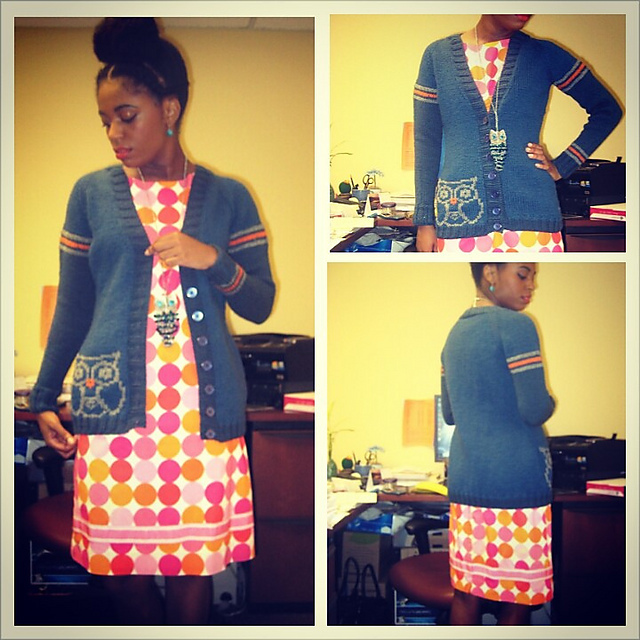 As you all know I just love making sweaters/cardigans. 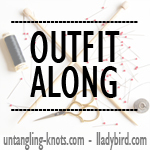 And my fave designer Andi Satterlund of Untangling Knots will be releasing a new pattern soon so, I am doing some pattern testing for her. 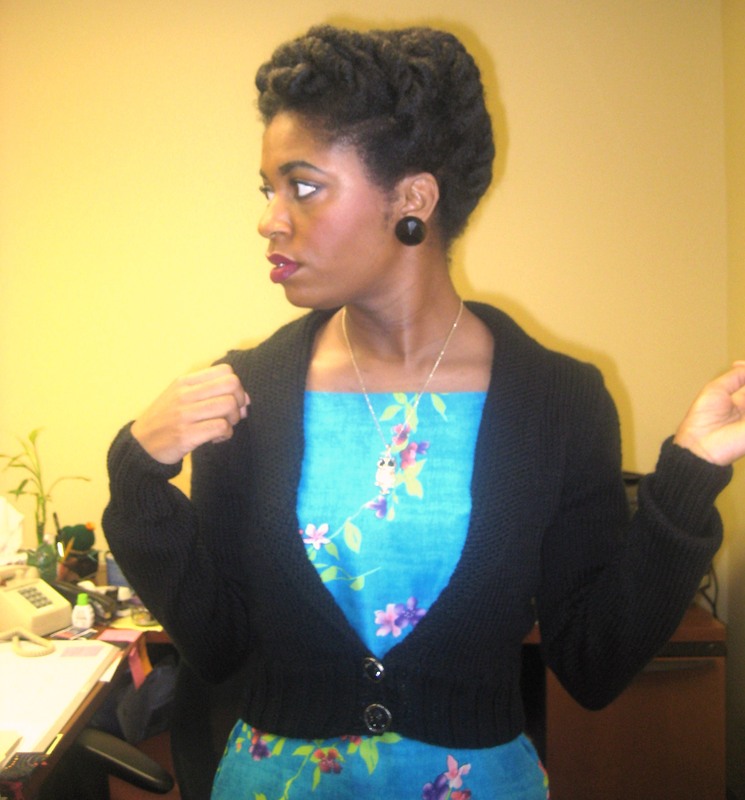 The shape of this cardigan is so vintage, so vogue, and so elegant. So, as soon as it was agreed that I could pattern test this for her I started thinking about colors. I wanted to go for something deep and rich. Something that made you think sultry yet, elegant. Something that made you think about those fierce movie stars from the fifties. So, I debated on deep colors like a rich dark purple, black, gray, and red wine. I went to the LYS yesterday. I tossed out that red wine color because I have used similar colors in the past. The gray was simply gorgeous but, I didn’t think it went for the feel I wanted because it looked a bit casual. There wasn’t a purple that was deep enough to my liking. So, black it was and I am so ecstatic about my choice!! Honestly, I was leaning toward black anyway so, it worked out. 😀 This is my first wearable in black. 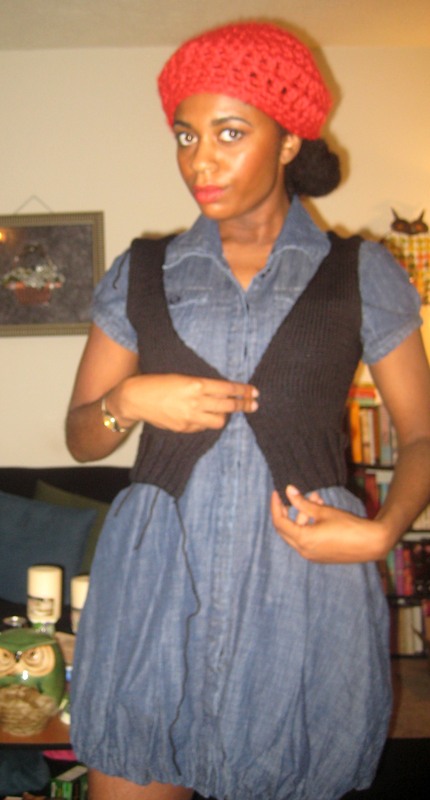 (I once made a black crochet hat). Since the stitch pattern is simple then, I feel this is the perfect project for it. For example, when it comes to lace and cables I always go for colors because I want the stitch pattern to stand out. 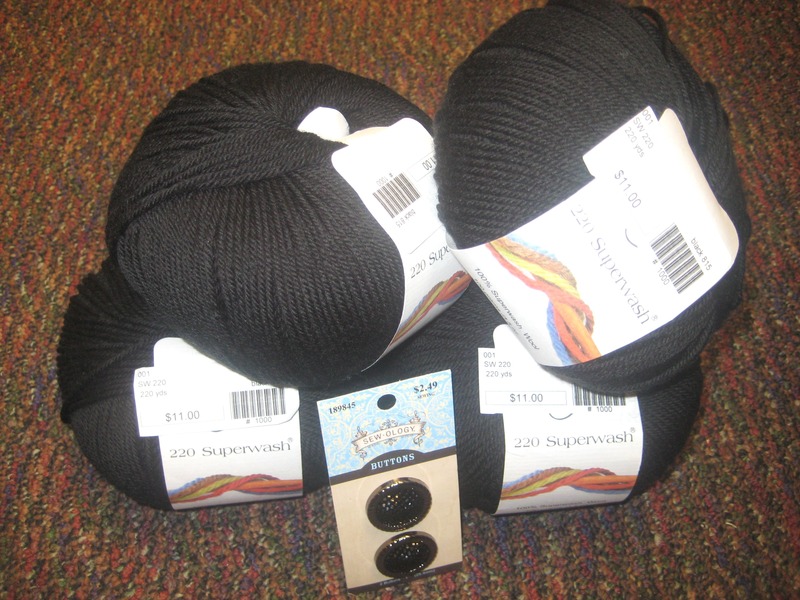 I am using Cascade 220 Superwash in black. After getting the yarn from the LYS, I went to Hobby Lobby because I am in love with their button section. My Dad was with me while I was debating long and hard about which buttons to choose. I was again thinking elegant and vogue. I kept asking him for his opinion while I was going back and forth. He was getting frustrated with me because I guess in his mind a button is a button. LOL. 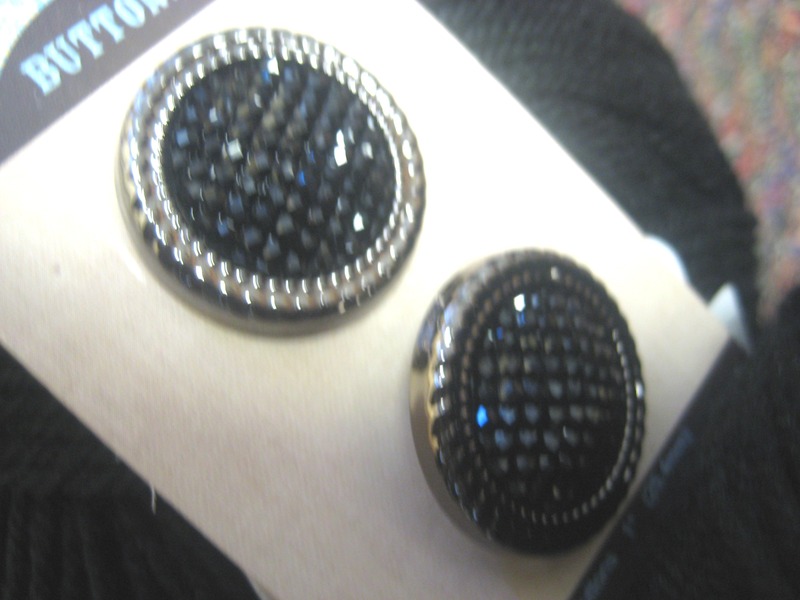 Well, I finally decided on these gorgeous black buttons with a antique silver trim. I am pretty pleased with the choice. Well, my niece and been steadily pleading and begging with me to make her some bowties for about 3 months now. Ever since I created those bowties for a friend she has wanted some with a desperation so, I am going to try to find time to make her some. Also, I am still working on the baby vest for my college friend’s baby boy. And this is why I don’t like making baby items. They grow so fast and it is imperative that you finish as soon as possible so, that the baby will be able to wear it. The good thing is I am about finished but, I did experience a hiccup yesterday and had to rip back about ten rows. I look forward to finishing it and shipping it. off. 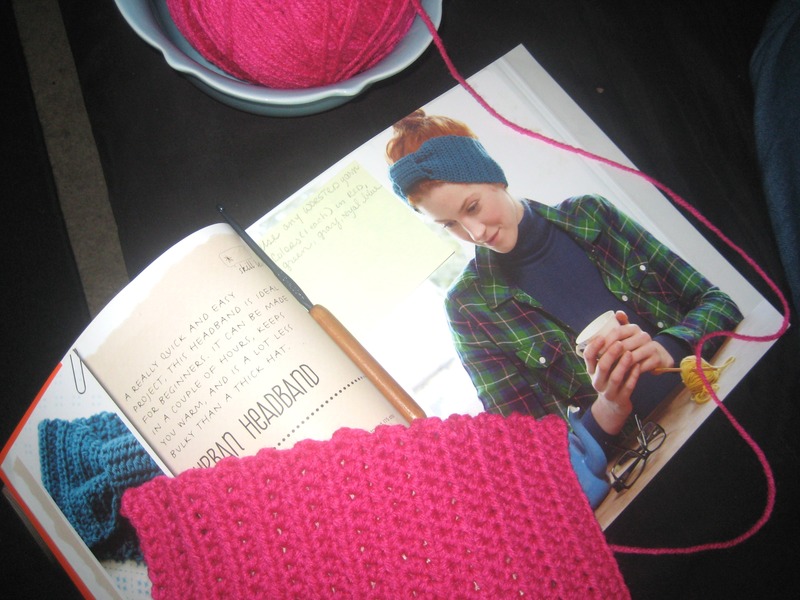 It seems that most of the things I have been knitting lately have been designs of Andi from Untangling Knots. 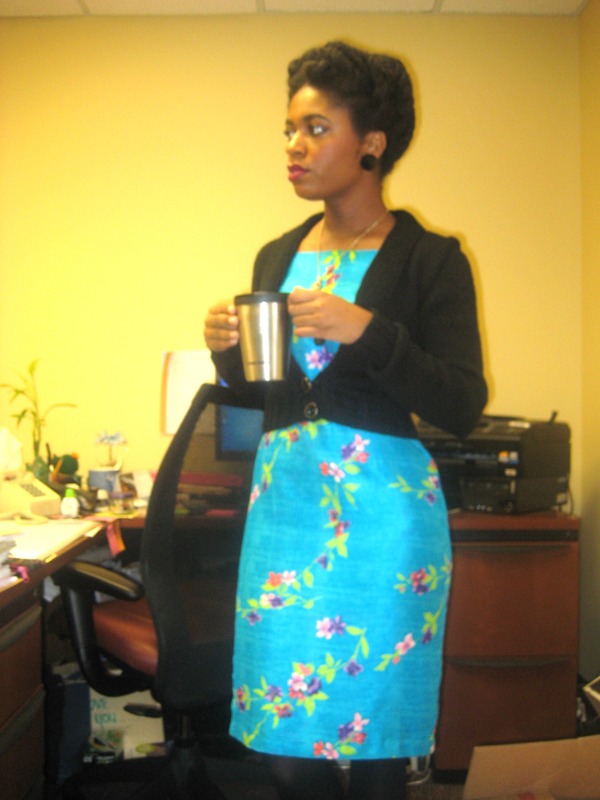 But, I just adore the vintage flair of her garments so, I find myself drawn to them. 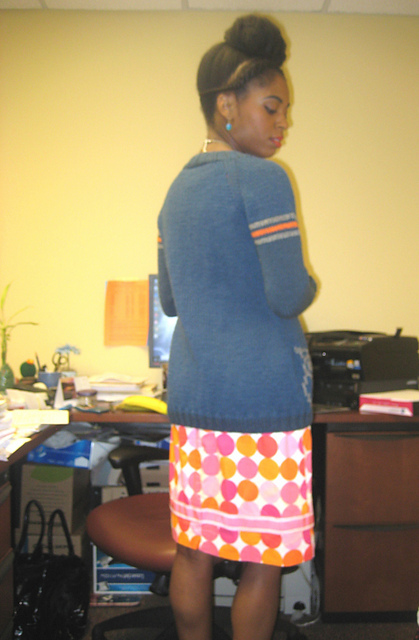 This cropped cardigan was part of a KAL, which I mentioned in a previous post. I have been pretty busy with traveling, studying for my graduate exam, and trying to enter into graduate school but, I found time to squeeze this project in. Overall, it was a very enjoyable project. This was my first time knitting an all over lace project and it was a learning experience. I thought it would be a pain to fix mistakes but, I was able to do so when they occured. And it did take a bit of concentration to avoid careless mistakes but, it worked out. The lace pattern was not hard to memorize but, I made sure to check back periodically to avoid mistakes. I am really, really happy with the end results and I just adore the fit. I am short-waisted so crop sweaters really flatter my figure. The salmon pink color is just beautiful to me also. For the buttons, I chose a simple cream color. I wanted the buttons to pick up the white flecks in the tweed and it did so beautifully. 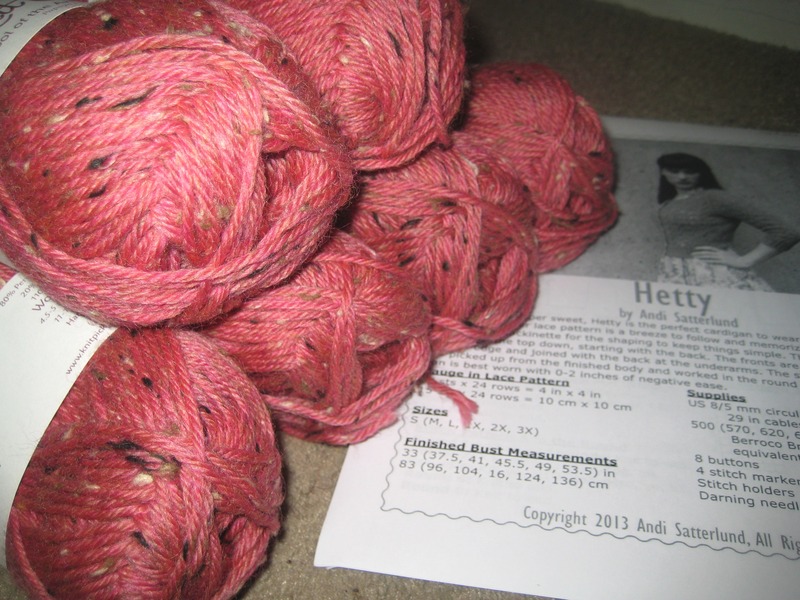 As I have told you all previously, I am participating in the KAL for Hetty by Andi Satterlund. You may click the badge to the right of the blog for more info. I started doing my gauge swatch over the weekend because my yarn arrived on Friday. Yay! However, I was making stupid and careless mistakes with the lace pattern. And it is not even a hard lace pattern. But, I was trying to do the swatch near the end of my full days and I think I was just tired and zoning out. Well, I finally got on track with the lace pattern. 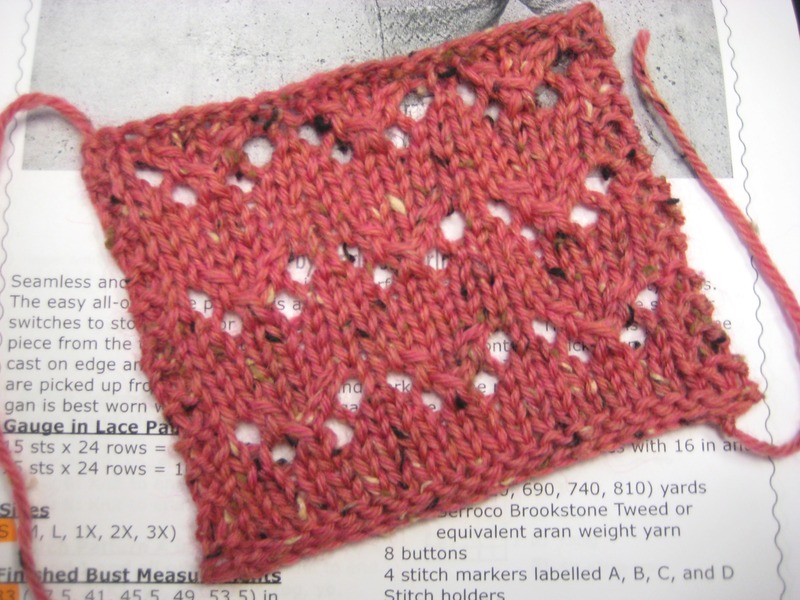 I first swatched on size 7 needles–even though the pattern calls for size 8. I had entirely too many stitches for the 4 inches. I moved on to the size 8 and I had 18 stitches per four inches. Then, I saw that Andi stressed the importance of doing a swatch and blocking it. So, I did this and I was able to get a perfect gauge of 15 sts X 24 rows = 4 inches. It was also good to swatch because then, the lace pattern really popped. At first it wasn’t that noticeable and a bit bunched. 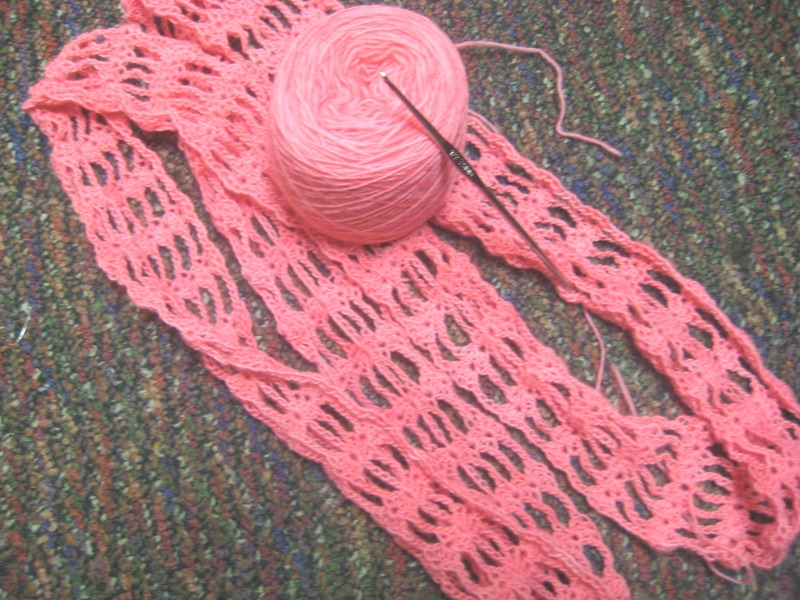 The swatch also gave me a good idea of how the yarn will look with this lace pattern and how it will block. I really like it. 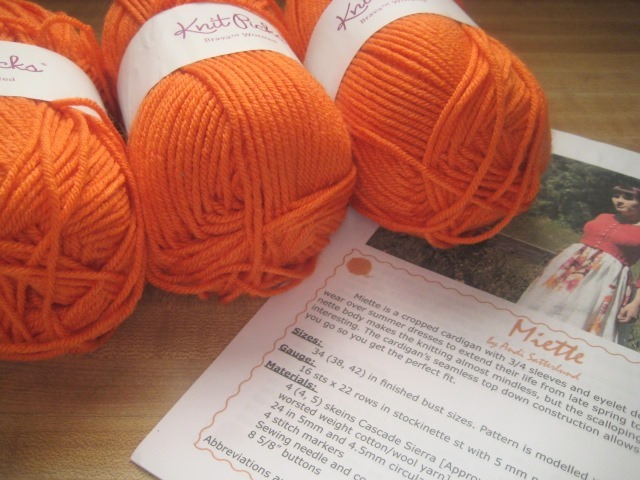 I am using Knit Picks Wool of the Andes Tweed in Papaya Heather. The sweater that took almost a year to complete! Settle in because there is a story behind my extreme love/hate relationship with this sweater. When, I first saw this cardigan on Ravelry over a year ago I just knew I had to make it. I stared at it for about a couple a months and then decided that it was worthy of my time. So, I didn’t have enough yarn of one color and I called up my sister, Alison, (a fellow needle crafter) and asked her if she could raid her stash and give me the yarn for this project. She gave me an Ivory color and Windsor Blue. I decided on the blue because I thought it was a rather unique type of blue and that it would be so versatile. I started the project and was really enjoying it. Then, once I got to the waist something happened. I was simply bored with the project. So, I stuffed it in a bag and left it there for some months. I would think about it every now and then whenever I was bored or wandering aimlessly. 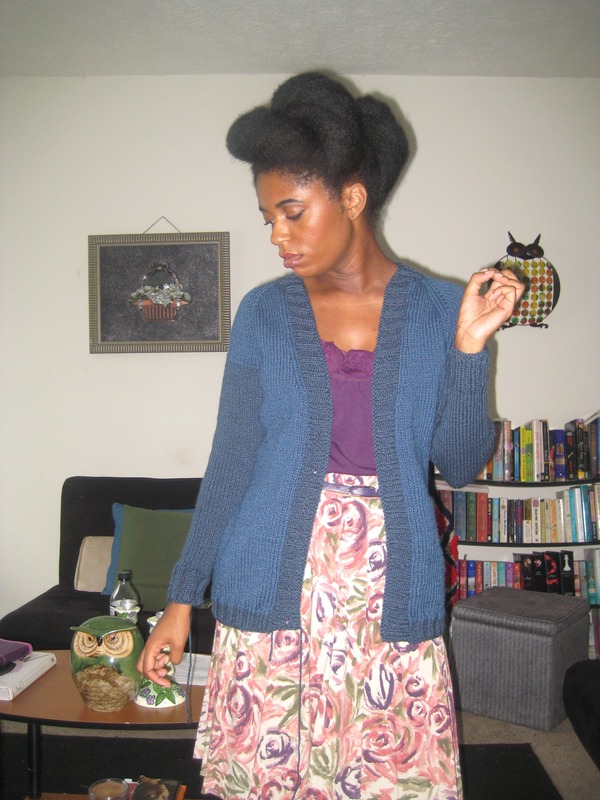 Like, I really should work on that cardigan. But, still I couldn’t trump up any enthusiasm. 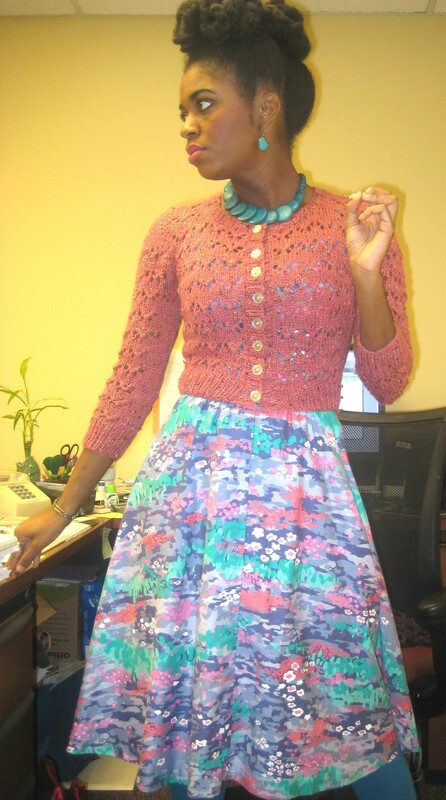 So, I would look at other projects of the cardigan on Ravelry to get inspired and I finally decided to pick it back up. So, one night after my many months break I picked up the project and finished the body. I was pretty pleased with the fit and decided to try it on for some pictures. The next day when posting the pictures to my Ravelry page I noticed the bottom ribbing was a different shade!!! But, the yarn said it didn’t have a dye lot. What the heck! So, again my enthusiasm was lost and the project was stuffed away again. When, working on another project I learned the duplicate stitch. And once I saw how easy it was, I figured that there might be hope yet for the cardigan that I had come to hate. So, again I went back to browsing other Ravelers cardigans and saw that someone had placed stripes on the arms of her cardigan. Yes! This was it! I decided to add stripes to the arms and to even add an Owl. See, I have an infatuation with owls so, I figured if I place something I love onto something I hate then, I should love it. I also figured that if I strategically placed the stripes that the different dye lot would not be as noticeable and that it would detract from it. 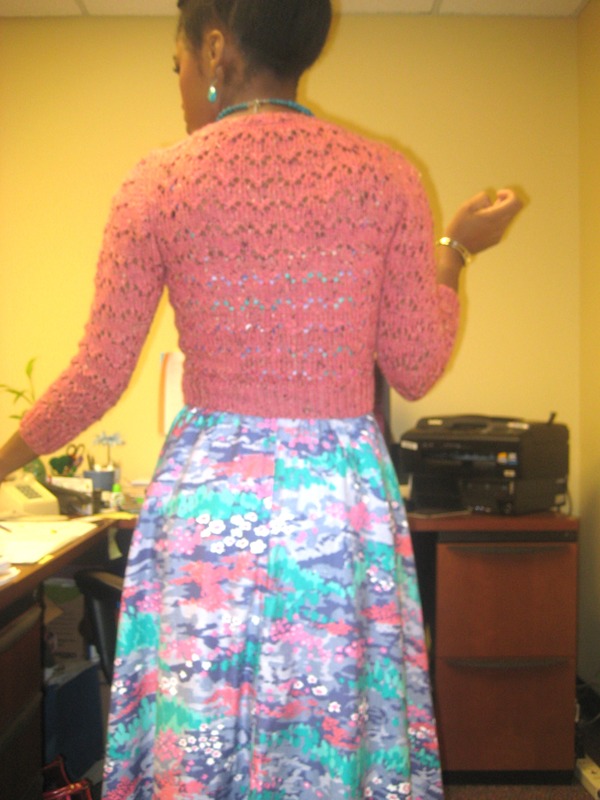 I finished the cardigan and added the duplicate stitch, which took about a week. And I must say, that I am pretty pleased with this cardigan. So, there you have it the story behind this special cardigan. Enjoy the pics.